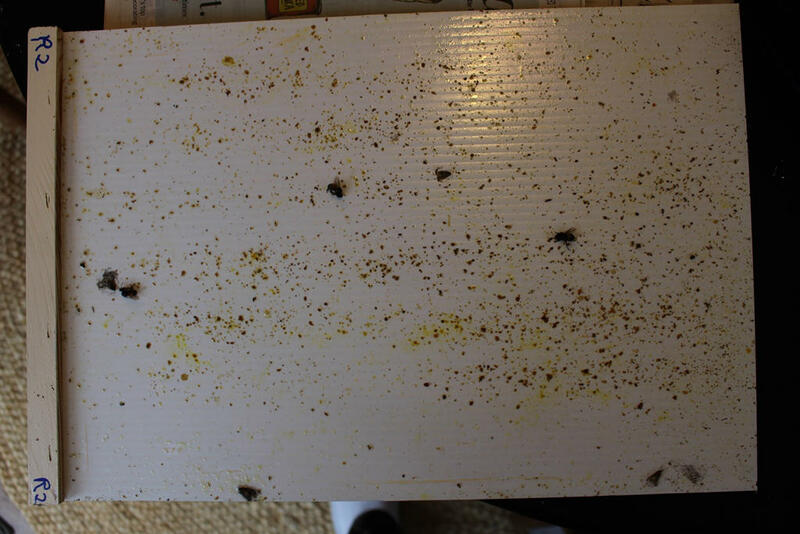 Now that winter is fast approaching, I finally checked for varroa mites in my hives. I should have done this over the summer, even once a month starting in May or June. Then I would have some good numbers for how my hives fared over the course of the year. Alas, tis not the case. Between vacations and family and work this summer, it seemed like I was only home long enough to catch my breath and do quick inspections of the hives. So one day I realized it was the end of August and I’d done no more than think about the possible mites in our hives. Varroa mites build up in a hive over time. The fertilized female mite hides in a cell with a capped bee larva and produces 3-5 offspring. In the spring and summer a healthy hive can out-produce the mites as an active queen can lay up to 2000 eggs per day. The mites just can’t keep up. As fall and winter approaches, however, the bee production goes down and mite production can take over the hive. Thus an infested hive will often die off in late fall or early spring. It is to the mites advantage for the hives to die off while other bees can discover and rob out the honey from a dead hive, as then the little bugs get a free ride to a new colony. So the recommended approach, especially for hobbyist beekeepers like myself, is to check the hives for mites. If the mite levels get too high, most people recommend treating the hive with an organic chemical such as formic acid or oxalic acid. Formic acid is most readily available in Mite Away Quick Strips, and oxalic acid can be applied as a dribble or a vapor. Both products are poisons, so there is some debate about their use, but they are organic and both are approved for use in the United States and most other countries. My two Langstroth hives Mars and Jupiter are based on Russian bee stock with various varroa-fighting properties instilled in them by the USDA breeding program. Both these hives had also received a brood break, Mars through supersedure (replacement) of the queen and Jupiter due to loss and eventual replacement (by me) of a new royal highness. Varroa mites reproduce in capped brood, so a break in the brood cycle typically reduces the mite population. With these advantages, both hives should be okay. So the top bar hive Venus was likely the worst off. Italian bees from California are known to breed great mite populations, and they lack the skills that Russian bees have for dealing with them. So this was the hive to worry about. Still, as a new package with no comb, Venus would have started with little or no mites. New hives often survive their first winter even with some infestation, as again the mites benefit from building to a climax in the second year when they can spread to other hives. Even so, it seemed prudent to sample the bees in Venus’ brood nest and then decide what to do from there. With no idea how to do a sample, I called my bee mentor Kristen and she offered to come over and help me how do an alcohol wash to count the mites. We set a date for that week, but on the day of the Big Mite Check Kristen called to say she was ill, so we postponed. The next week I was on another trip for work, and lo and behold it was the end of September and cold outside. So I never checked the mites. Feels good to confess my failings. Which brings us to this past week. 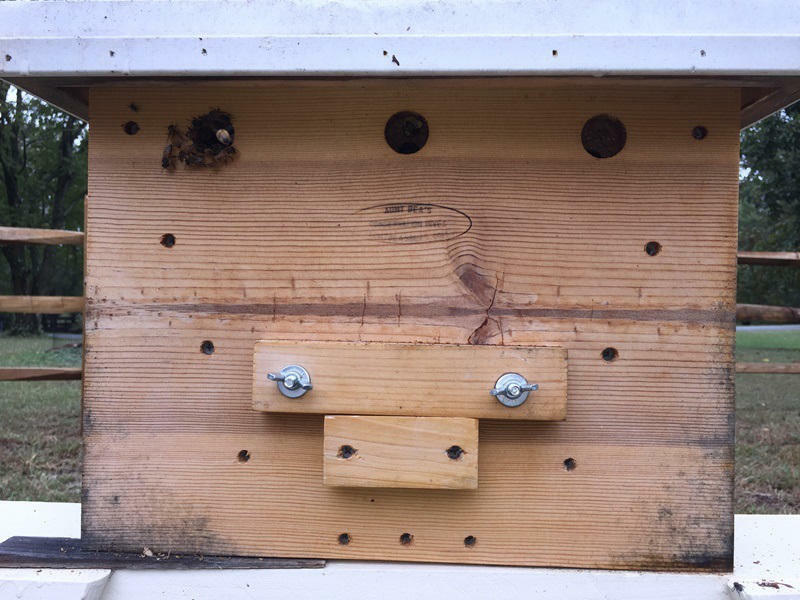 Besides sampling bees directly, another way to check for mites is to use screened bottom boards, which provide a screened opening for the bottom of a hive. Mites, mostly older ones, fall through the screens, so checking the mite fall under a hive gives an indication of how invested the hive might be. Not as good as sampling brood bees, but still an indicator. 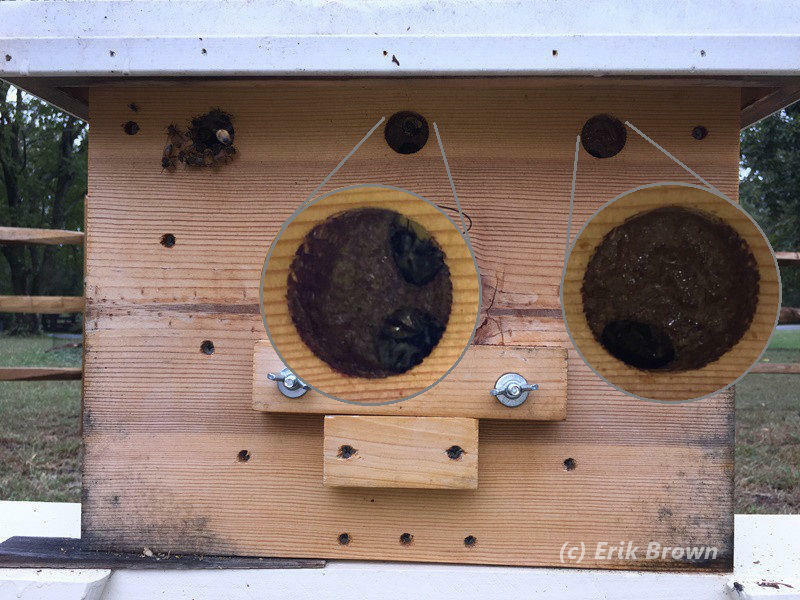 As both my langs have screen bottom boards, I spread some vegetable oil on the slide-in boards (so the mites would stick) and inserted them below the screens of each hive on September 29. Exactly two days later, on October 1, I pulled them out to check the results. In addition to a mite count, the pollen and other debris reflects the activity in the hive. The bottom board from Mars on 10/1/2015. Some bees were trapped underneath, and the small moths are likely wax moths hiding beneath the hive. Most of the dots are pollen, while the concentrated area must be below where the bulk of the cluster was located. It was a bit cold and raining during this time, so if anything I expected a higher count with the full colony somewhat trapped in the hive. I looked and looked and looked and could not find any of the little buggers on the boards. A few Internet searches later there were a few blobs that I figured were probably mites. Still not certain as I couldn’t find their little legs even with a magnifying glass, with this approach I had 6 mites from Mars and 4 from Jupiter, or a 24 hour count of 3 in Mars and 2 in Jupiter. The wax moths are a slight concern, although with both hives strong the bees should be able to handle them. I will have to worry about that later. The bottom board from Jupiter on 10/1/2015. Again we see some bees and wax moths. There is less debris here than Mars produced, so odds are there are fewer overall bees in this hive. This makes sense as Mars has an additional medium box compared with Jupiter. Given my uncertainty and the low mite count, both Mars and Jupiter appear fine. Both hives seem heavy when I heft them, and in my last post I mentioned how they had nearly filled up the few remaining frames. I continue to feed them every couple weeks (especially Jupiter since it is smaller), and if we get a warm spell I would like to do a final detailed inspection to get a firm count of their stores for the winter. We’ll see in the spring if I was wrong. My final winter prep will be to add some mouse guards to the entrances made from 1/2 inch hardware screen. This will keep the mice from building a winter nest at the base of the hive when the weather is consistently colder. For Venus, at this point she’s on her own. This week we should have some sun and warmer weather above 70 (over 20 Celsius), but I am travelling again so checking for mites is not an option. I’ve been trying to feed this hive some 2:1 syrup as last I looked she seemed a bit light on winter stores. Yesterday we had our first sun in well over a week, and the bees were active early to enjoy the day. I even saw a couple bees bringing some pollen in. A picture of the front of the hive is at the top of this post. I was planning to place corks in two of the front entrances for winter warmth, but looking closely I found that the bees beat me to it. Two of the three entrances are mostly sealed. 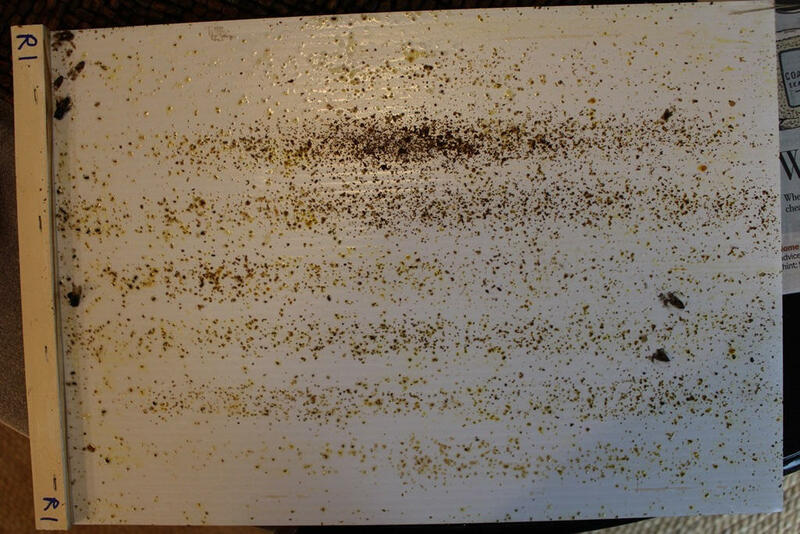 The following picture shows a blow-up of each entrance so you make out the propolis the bees have used on these two holes. The hive has always favored the left-hand opening, and they continue to use this for their comings and goings. Venus with two entrances expanded to show the propolis covering the back of these holes. Look closely and you’ll see it. Those clever bees. I will probably cover the holes anyways, perhaps with duct tape now rather than a cork (and yes, I’ll cover the tape so the bees don’t stick to it). I should also put a mouse guard over the open hole to keep any adventurous mice that climb up the hive from entering. Today our title comes from the Billy Joel song You May be Right, released as part of the 1980 album Glass Houses. For you Dave Barry fans out there, the song was also used as the theme song for the television show Dave’s World. My favorite line in the song is “You may be right, I may be crazy; but it just may be a lunatic you’re looking for.” For some reason this captures how I feel about the varroa mites in my hive. We treat our dogs and cats for fleas, and clean our counters to kill bacteria, so why are we concerned about treating bees for varroa? Especially with organic compounds like formic acid and oxalic acid. I’m not sure, but I still feel reluctant. So I may be a little crazy in my approach here. We’ll see how the bees fare over the winter. Correction: in the original version of this post I mentioned thymol as a treatment, rather than the proper compound in Mite Away Quick Strips, which is formic acid. The post has been edited to correct this. Thanks to “prospectofbees” for catching this. You say you couldn’t see the varroa mites’ little legs even with a magnifying glass – that puzzles me as I can see their legs with my naked eyes. Sometimes I even find one that’s still alive and see it walking about. I can see the mouthparts too. I wonder if you were just seeing debris? Their bodies should be slightly shiny. Sounds like the bees are doing great anyway. Thanks, I was wondering about their legs. Definitely nothing walking around. It might be debris, but I was trying to determine a conservative number and that was it. Either way, they seem to “bee” okay. Thanks as always for your insight. Wee correction: MiteAway Quick Strips are not thymol but formic acid, another popular organic treatment. Treating bees vs cats and dogs just feels different. Treating the latter pets is usually routine prevention and occasional specific response to something acute. At least until they get older. Treating the latter is more like managing a chronic illness with its constant monitoring and juggling of medications. It requires a lot of effort that used to be unnecessary. I knew MAQS were formic acid, not sure why I got confused. I’ll have to fix it when I get back to my computer. Thanks for the correction. I agree it feels different, probably why many people worry about it. Hope your bees are settling in for the winter safe and snug. Since you’re confessing your failings, I’ll confess mine, too. I haven’t done a mite check in 3 years. Once in a while, I see a mite, but not very often. So far, just making splits has worked for me. Thanks, Julie. Been away but home now and sorting my options. I’m pretty comfortable with the Langs as they are Russian bees and the count I just did here is low. The top bar hive I should really sort out, they are Italians and have been cranking out bees since the spring.